Keep on Rowland: Can You Escape? As many of you know, we have quickly become an Escape Game family. What started as a crazy idea on a legal pad in Three Brother Brewery has turned into a crazy-fun family owned and operated business that we are so proud of. This crazy beginning has now expanded into another location. We have officially opened our doors in the heart of downtown Music City, USA- Nashville, TN. The Escape Experience Nashville is located at 501 Union in downtown Nashville. People often ask what an escape experience is. An escape experience is an interactive group activity in a real world scenario that forces you to think outside of the box, work together and communicate in order to escape. All types of groups enjoy the escape experience. We see couples looking for a different type of "date night", families, corporate groups, friends, church groups and all kinds of genres of people. Although we recommend children to be around 12-14 years old to participate, the escape experience is for people of all ages. Young and young at heart alike, everyone seems to enjoy the thrill! "I am so excited for our expansion to Music City. Nashville is not only home, but is a thriving and growing city," says Escape Experience Nashville manager and my talented brother-in-law, Spencer Rowland. "We believe that The Escape Experience Nashville provides a unique and true-to-life experience that separates us from other escape companies. We are excited to offer our current scenarios to Nashville and hope to open some brand new scenarios as well." 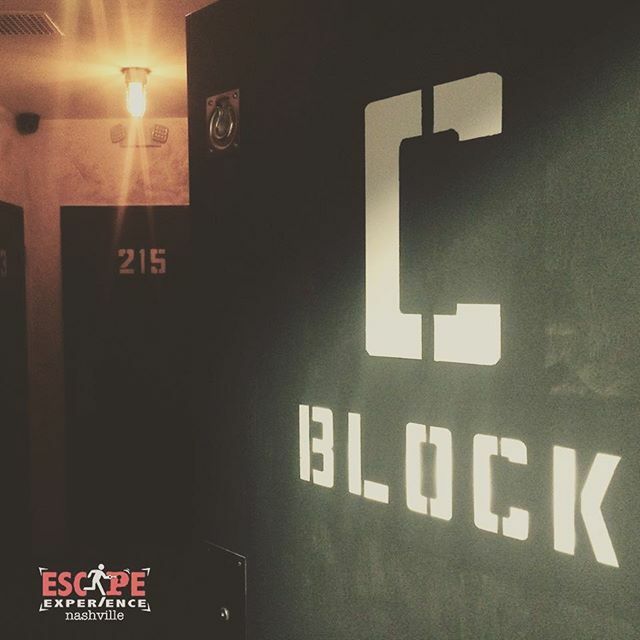 This Escape location offers the "C- Block" scenario and will soon offer "The Inheritance" as well. C Block is a real-life prison scenario in which participants are locked into the scenario with one hour to escape with clues left from "someone on the inside" or they risk being locked in forever. "My Friends and I tour with a musician as part of the crew and have had the opportunity to do Escape rooms world wide and this one was actually the most creative and challenging one to date... "
"This is the most fun thing I have ever done in Nashville and I have been living here for over 8 years." Escape Experience Nashville is open for booking online on our website, which you can see by CLICKING HERE. I'd love to experience the "C- Block" scenario. Sadly I'm on the wrong side of the Atlantic!